WASHINGTON, DC — Ahead of the State of the Union Address, Faith In Action’s immigrant justice campaign, LA RED, offers comments from clergy, faith leaders, Dreamers, and a member of our community who has sought asylum and is in sanctuary at a Maryland church, regarding the state of immigrant justice in the U.S. under the immoral anti-immigrant leadership of the Trump administration. The comments of these advocates will be posted on social media throughout this afternoon and evening, to counter Trump’s message, which demonizes immigrants who seek safety and preservation of their families. “The president has created the humanitarian disaster at the border, and instead of holding immigration agencies accountable, he is demanding increased funding for unjust enforcement and an arrogant border wall to serve as a monument to himself. “Let us never forget that children have been separated from parents and the government has no intention of reuniting these lost children; adults and children have died in immigration custody; immigrants seeking asylum have been denied their rights and have been tear gassed; and taxpayers’ dollars have been wasted in the process of this deadly abuse. “Deploying additional law enforcement, immigration enforcement agencies, or military personnel to the southern border endangers the rights of migrants and residents of border communities and does nothing to make us safer. 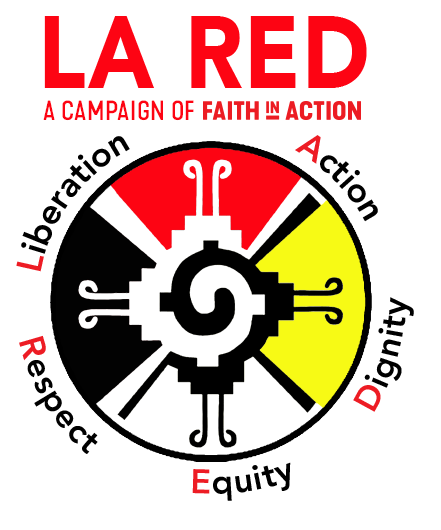 The following comments are from members of the Faith in Action/LA RED community. “Mr. Trump is using us, immigrants, to get money for the wall, which is immoral. The wall will not solve anything; the money should be invested in education or health care,” said Rosa Gutierrez López, asylum seeker and mother of three U.S. citizen children who is in sanctuary in Bethesda, MD. “If government is being poisoned by bigoted and racist policies, the people must remember that the only antidote against that is our voices, our votes, and love for our fellow human beings,” said Dannie Lerma, Dreamer with Faith in Indiana. “We need to break down barriers for love, not build walls for hate,” said Rev. John A. Mennell of St. Luke’s Episcopal Church, Faith in New Jersey. “In this deeply divisive time in our nation, we need a politics of love — a love that builds bridges not walls; a love that affirms our shared humanity rather than devaluing the lives of any of us; a love committed to living wages, universal health care, and economic security for everyone, rather than the wealth of so few at the expense of so many; a love that inspires hope rather that stoking fear; a revolutionary love that demands the racial, economic, and immigrant justice at the heart of the Beloved Community for which our hearts yearn,” said Rev. John Gregory-Davis, Granite State Organizing Project, New Hampshire. “The United States was formed to respect the rights and dignity of all who seek freedom and opportunity. The State of our Union is only as strong as the compassionate values and faith of its people,” said Father Tom Smith, OFM Conv., New Mexico CAFé. “If a nation is emotionally capable of approving of injustice, it cannot lay claim to greatness…real greatness consists in the inmate quality of fairness and righteousness,” said Rabbi Jason Rosenberg, Faith in Florida. “In Islam, it is the worst type of injustice to break the Divinely established relations of the womb — to break families apart. This is exactly what the administration’ misguided and wrong-headed policy is doing when it authorizes the taking of children out of the hands of their mothers at the border, and also within our country as well. Those who support and advocate for the right to life for the unborn, have no other moral choice but to do the same for these children once they are born and keep them united in love with their mothers, fathers and siblings,” said Saffet A. Catovic, Imam and Muslim Chaplin at Drew University in Madison, New Jersey and member of the statewide clergy council for Faith in New Jersey.